The country house with a small lake (2 units) is situated in the middle of a 1.6 ha natural property in a tranquil, detached location, 900m from the village. Flooded with light but perfectly isolated against the summer heat; there is a live-in kitchen (20 sq.m) with a comfortable sofa, a large bedroom (22 sq.m) and a cosy bathroom (6 sq.m, wc, shower, bidet). The accommodation offers a mix of antique and functional furnishings. 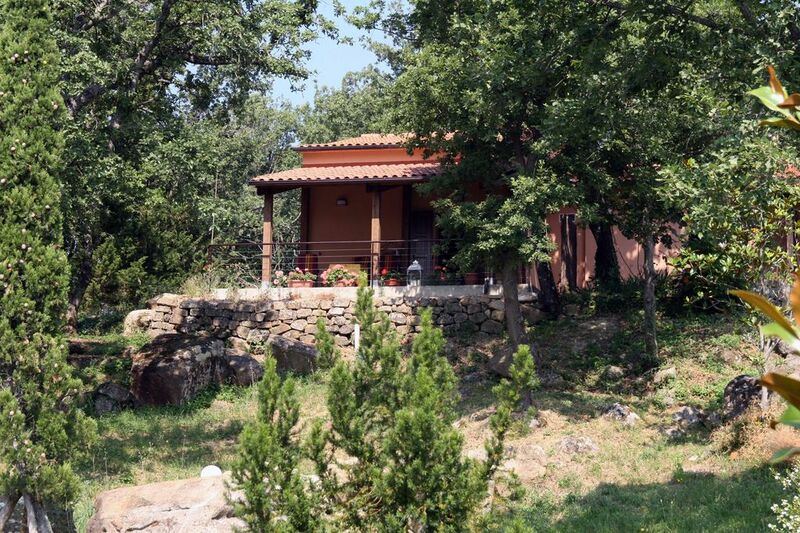 You have a view of the gentle, rolling countryside of the Tuscany, a small lake that is part of the property (possible to swim) and the old trees. The large terrace invites you to enjoy delightful meals (BBQ facility); fresh rosemary, sage and basil from the herbs bed provide the necessary condiments. During the day time, you enjoy the view of the small lake and the landscape, while during those warm summer nights you will discover the secretive shining of the fireflies and the 'light nests' that are the small villages nestled in the hills. Nature and water at any time of the year: The mild winter, the 'bloomy' springtime, the sundrenched summer, the warm, aromatic autumn - each season offers its own charm on this basically unspoilt property. During the entire year, you can discover different animals (roe deer, turtles…) and plants (mimosas, strawberry trees, porcini mushrooms...). Spacious, round boulders on the most pretty panoramic spots provide natural benches to watch animals, take pictures, read or simply enjoy sweet idleness. Depending on the time of the day, different spots in the property (equipped with garden furniture and sun loungers) offer great views. You can enjoy the small lake that is part of the property as a swimming pool, just note that the natural water level might vary. The beaches in this part of Tuscany are the prettiest of the region thanks to the quaint bays, the fine sand and the dense pine forests and they are not yet overly crowded (water sports are possible). Celebrate like the old Etruscans: Guests interested in culture and history will be happy to find out that our country house is located in the middle of the antique Etruscan country. It is an ideal starting point for discovering the Etruscan sites of Vetulonia, Populonia, Roselle and Saturnia. Even Tarquinia (with its lively mural paintings) can be reached within a day trip. The museum in Grosseto exhibits an impressive collection of Etruscan items. In the immediate and close environs there are numerous cultural offers that provide great day trips: medieval village feasts and crossbow shooting, the traditional donkey and horse race (Palio), numerous music events (classical and contemporary) in old churches and monasteries, as well as wine festivals, culinary village feasts and antiques fairs. Opera lovers can visit the Puccini Festival or the Lirica in Piazza in Massa Marittima . With pleasure we provide an extensive folder with information that we collected throughout many years. Enjoying wine in a scenic landscape: You will find it challenging to break away from the marvellous view and the absolute relaxation that you can enjoy on the terrace. If anyhow you want to explore the area, you might be tempted by the possibility to by olive oil or wine directly from the farmers themselves. Especially recommended for wine lovers is the small town of Montalcino with its gorgeous old town. It is the spring of the best wines of Italy, the „Brunello di Montalcino“, maturing in oak barrels, which can be tried and purchased everywhere in the village and its environs. Furthermore, the countryside is ideal for long walks and hikes of several hours, trips by bike or horse (there is a book with hiking routes in the house). Next to Florence, Siena, Volterra and San Gimignano it is also possible to visit numerous smaller, charming sites in the immediate vicinity that only few tourists ever find. Special attractions are the thermal spas in Saturnia and Petriolo. The floor of the house is a simple terracotta floor; large windows provide plenty of daylight. The kitchen is generously equipped with dishes and utilities. If you feel like it, you can prepare refined dishes, you won't miss anything. In the shelf you find some Tuscan cook books that might inspire you to prepare some filled zucchini flowers, for example. All windows are fitted with fly screens, so that you can leave them open all the time without being bothered by insects (mosquitoes etc. are rather rare). During the night, all doors and windows can be closed with solid wooden doors. The location of the house is very secure. There have not yet been any thefts. Our guests repeatedly confirmed that the holiday in this small house in the heart of nature is a very special experience. The discovery of rare plants (for example strawberry trees), watching shy animals on the property (roe deer, herons) and relaxing by the small lake, our 'natural pool' allows to recharge your batteries for new daily challenges. This idyllic spot has been repeatedly compared to a small paradise. We are especially happy about this kind of feedback since we really do feel the same way. And here is some practical information: Bed linen and hand, swimming and kitchen towels can be rented upon request. An extensive and frequently highly appreciated folder with many tips (tours, culture, restaurants, hiking, shopping...) can be found in the house. During the cooler months, heating is possible. There are parking facilities on the property. We happily send you a small brochure. Casa Lago lies in the middle of the romantic Tuscan rolling countryside and offers stunning views at any time of the day. A small private lake serves as a natural swimming pool. The property is a natural paradise in which you can discover different animals and plants the whole year round. Large natural stones on the most pretty panoramic spots serve as benches to enjoy the view, watch animals, read or simply enjoy sweet idleness. By foot from the house you can reach the village of Sassofortino with its pretty, winding old town in hillside location. Here you can experience the original Tuscan lifestyle with bakeries, grocer's, butchers, small convenience stores...Additionally, there are a small café/bar and two pizzerias/restaurants offering typical cuisine. The accommodation is located in the centre of the 'Strada del Vino', a DOC wine-making region, comparable to the 'Gallo Nero' of the Chianti region. The sea is about 35 km away, Siena about 50 km. Golf: Close to Sassofortino, there are two of the prettiest and most exclusive golf clubs of Italy. The year-round 18-hole courses lie amidst vineyards and olive groves and thanks to small lakes, waterfalls and the Mediterranean flora there are especially attractive. Yachting and tennis clubs are only about 10 to 20 km away, some even have their own. Hence, a special golfing experience can be ideally combined with a beach and cultural vacation.